Champaca handmade soap has notes of Patchouli, Sandalwood, Amber, Vanilla and spices. A luxury soap that will lavish you skin with creamy gentle bubbles leaving a soft scent. Champaca handmade soap is fragranced with Patchouli and Sandalwood with touches of Amber, Vanilla and spice notes. It’s a classic and spicy scent, based on popular incense. In India, this scent is used for meditation, ceremonies and celebrations. Champaca is a little sweet and a little earthy. 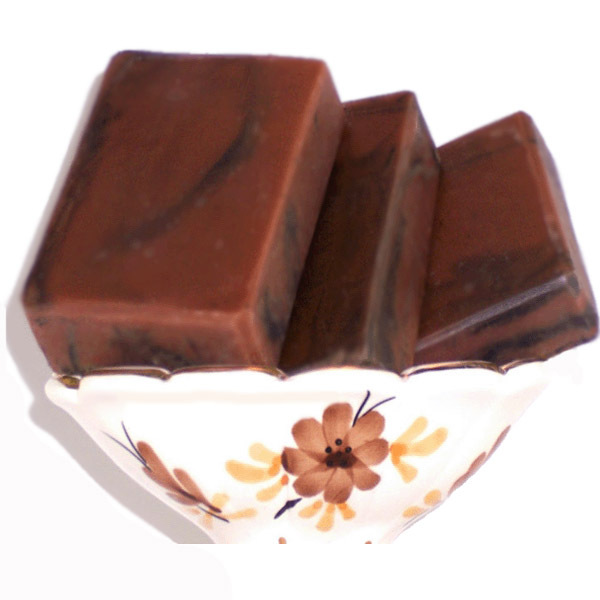 If you love Patchouli or Nag Champa fragrance, you will love this swirled brown and black soap! My soaps are created with the cold process method and not gelled, to keep the fragrance true. All my soaps are superfatted so they clean gently and thoroughly without drying the skin. Since each soap batch is made by hand, the brown and black swirls will vary from bar to bar and are unique. As each soap is cut by hand, there are minor variations in size, color and weight. My soaps can be cut into smaller bars if you wish. That way you can bring more than one soap with you or change the soaps in your bath or shower as you like. This handcrafted soap will lavish you skin and make it softly scented with its fragrance. Improve your outlook on life for the better with this handmade, artisan soap! Ingr: Olive oil, Coconut, Palm Kernel, Mango Butter, Castor oil, Soybean, Sodium Hydroxide, Beeswax, Sodium Lactate, Fragrance, Mica, Activated Charcoal, Brown Oxide.